THE Guru Granth Sahib is indeed unique in its thought, literary expression and the message it continues to communicate centuries after it was written. Exalted thought needs to be transported on the vehicle of language to reach the masses. Poetic expression lifts prose to a higher plane. When verse and music meld, their beauty and sweetness makes mind transcend the humdrum of rational existence. This is divine love, passion pure expressed poetically; set to select 31 ragas.... The thought is egalitarian, expressed in a language that can be lucidly understood by the masses and the compositions are poetic, composed in the traditional Indian meters. As Bhai Kahan Singh’s Mahankosh tells us, the Guru Granth Sahib contains the bani (sacred compositions, literally utterances) of six Gurus, 15-non Sikh bhagats (saints) whose bani was in consonance with the teachings of the Gurus, 17 bhattas (bards) and four others. The message, over the ages: Mulmantra, as seen in the Harsahai pothi (foreground) and a later illuminated manuscript. 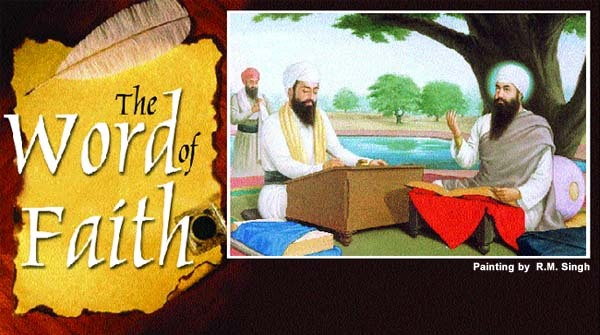 Guru Arjan Dev, the fifth Guru of the Sikhs, had the bani of the first four Gurus compiled in a manuscript for which he asked Bhai Gurdas, a major Sikh theologian, to be the scribe. It was this manuscript, the Adi Granth, which was ceremoniously installed in the sanctum sanctorum of Harmandir Sahib at Amritsar in 1604 AD. The manuscript also had Guru Arjan Dev’s compositons, the writings of bhagats and some others like Bhai Mardana and Sunder. The work of scribing the bani of the Guru started in the lifetime of the founder of Sikhism, Guru Nanak Dev. His compositions were carried in oral tradition as well as written down by his followers, even during his journeys. There are references in Puratan Janamsakhi to Hassu Lohar, Shihan Chheemba, Saido Jat, and Tan Sukh Bania, who were also among those who accompanied Guru Nanak during his journeys or udasis and penned his bani. Guru Nanak had founded Kartarpur, at present called Kartarpur Ravi and Dera Baba Nanak. It is now in Pakistan, just across the Ravi and is visible from the Indian side. It was here that the Guru settled down with his family in the twilight of his life. He was then in his seventies. As Bhai Gurdas, who was later to scribe the Adi Granth (original manuscript), says: "The morning would begin with the recitation of Japji and Asa di Vaar, after which people would continue with their worldly duties. In the evening, Sodhar and Aarti were recited." The Janamsakhis tell us that Guru Nanak compiled Japji and Asa di Va at Kartarpur. He asked Bhai Lehna to assist him in editing these compositions. He was subsequently chosen, over his own sons, by Guru Nanak as his successor and named Angad, a part of oneself. As tradition puts it, Guru Nanak gave him the pothi (manuscript) that had 974 of his compositions (Pothi zuban Angad jog mili). Guru Angad added 63 of his compositions and gave the corpus to Amar Das, who was to be the next Guru. He was to add 907 compositions. Guru Amar Das made his grandson, Sahansar Ram, write the manuscript. It included the bani of Guru Nanak Dev, Guru Angad Dev and Guru Amar Das. The works of the bhagats were also included in it. A number of manuscripts were written, two of which are still available. They are known as the Goindwal pothis. These pothis also have Guru Amar Das’s forceful message about bhagat bani’s inclusion and importance, and of how the bhagats were influenced by Guru Nanak (Nama chimba Kabir julaha pure Gur te gat pai). Guru Amar Das decided that the next Guru would be his son-in-law, Guru Ram Das. At this, his two sons were unhappy and they kept the manuscripts with them in order to project their own importance to the followers. The pothis were thus kept by Bhai Mohan, Guru Amar Das’ elder son. The other major source of bani of Guru Nanak was the Harsahai pothi, which was with the family of the descendants of Prithi Chand, elder brother of Guru Arjan Dev. This manuscript was to remain with the family till it was stolen in 1970-71. When Guru Arjan Dev decided to compile the bani of his predecessors, there were thus a number of significant manuscripts that contained the Gurus’ compositions. Some had certain compositions that Guru Arjan Dev did not consider authentic. In order to consolidate the bani and prevent any spurious compositions from creeping into the original texts, he decided to have the Adi Granth compiled. The Tawarikh Guru Khalsa tells us that everyone who could contribute was asked to do so. 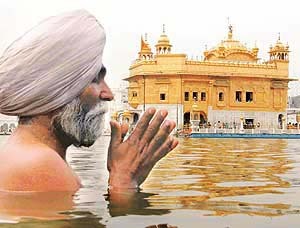 The Guru issued hukamnamas to all Sikhs, asking them to bring the bani of the Gurus to Amritsar, where the editing was to be done. He called the rababis (rebeck players) who had memorised the bani, as well as ordinary Sikhs, who had preserved the bani safely. It was with this corpus that the editing began. Every available source and content was carefully scrutinised and Guru Arjan Dev kept only what was considered absolutely authentic. The task of making the manuscript was entrusted to Bhai Gurdas. The compositions of the bhagats were also scrutinised. The bhagats whose works are contained in the Guru Granth Sahib came from different regions of India and wrote in regional languages. The number of their compositions which were included is given along with their names: Kabir 541, Farid 116, Namdev 61, Ravidas 40, Trilochan 4, Beni 3, Dhanna 3, Bhikhan 2, Jaidev 2, Parmanand 1, Pipa 1, Ramanand 1, Sadhana 1, Sain 1, Surdas 1. The bhagats were from different religious denominations. They also belonged to different castes, including the so-called low castes, and came from different parts of the country like Uttar Pradesh, Bengal, Maharashtra, Mysore, Sindh, Rajasthan and Punjab. 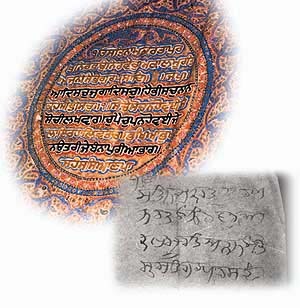 The bhagat bani gives a unique inter-religious, inter-regional flavour to the Adi Granth and the bhagat bani of the Guru Granth Sahib is a wonderfully catholic, cosmopolitan aspect of this scripture. While scribing the Adi Granth, Guru Arjan Dev ensured that the matter was arranged in a particular order and that everything was in proper context. The author of each composition was identified; the context determined the placing of the bani; the appropriate ragas were determined; and the whole text numbered, so that nothing could be interpolated. Scholars contend that the earlier manuscripts were written without any break between words to prevent anyone from inserting anything between these, and this tradition continues. A raga is usually defined as a musical arrangement that brings forth love in one’s mind. The arrangement of ragas in the Guru Granth Sahib is, according to the Hanuwant system, without the raginis. All the hymns are meant to be sung; and kirtan, the singing of the bani in an appropriate raga, is considered by Gurmat as an essential part of the religion and the sole form of worship among the Sikhs. Singing kirtan creates a shared community experience through repetition. As Raghav Menon, an authority on music, puts it, "Sikhism uses music to subtly subvert the inner resistance of the human being, transform and regenerate him and trap him into an awareness of his inner essence." (whisk), and the Sikhs, led by Bhai Gurdas, accompanied the solemn and grand procession to Harmandir Sahib, where the Adi Granth was installed. Guru Arjan Dev and other Sikhs sat at a lower level. The bani of the Adi Granth held an exalted status. Baba Budha became the first Granthi. Soon more and more Sikhs concentrated on learning Gurmukhi, since the bani was written in this script. The Sikhs also started making copies of the manuscript of the Adi Granth, some of which can still be seen. While the installation of the Adi Granth at Harmandir Sahib was of great significance to the Sikhs, it also caused jealousy to some, especially the estranged relatives of the Gurus. This led to an interesting incident that finds mention in history. In 1605, when Emperor Akbar was visiting Batala in Punjab, he was told that the Sikhs had a holy book that contained passages that were blasphemous to Islam. The Emperor called for the Adi Granth, which was sent by the Guru in the custody of Bhai Gurdas and Baba Budha. Bhai Gurdas, who had written every word of it, assured the Emperor that there was nothing against Islam, and that on the contrary, it contained hymns of Muslim saints. The Adi Granth was read at random in the presence of qazis and pandits. The first stanza said: "We are all children of our Father God." When it was opened next, it said: "God pervades all His creation and the creation resides in Him. When there is nothing but God, whom should one blame." The Emperor realised that there was nothing blasphemous in the document and he made an offering of gold coins to the Adi Granth. Robes of honour were presented to both custodians of the Adi Granth. This became the first significant instance of someone recognising the intrinsic truth contained in the Adi Granth and thereafter making a symbolic offering to it, something millions do every day, the world over. Guru Gobind Singh, after adding 115 compositions of his father, Guru Teg Bahadur, and Jai Jai Vantee Raga to the extant 30 ragas in the Adi Granth, proclaimed near the end of his life that henceforth there would be no person who would be the Guru of the Sikhs. The sole Guru would be the Word enshrined in the Guru Granth Sahib. The Word of faith, scribed for two centuries, was now complete and final. THIS is the story of a city which was founded by Guru Ram Das and developed methodically by Maharaja Ranjit Singh. An invitation was extended to a varied lot of people from 22 different vocations to set up shop, and start a modern city around the Golden Temple. Each set of entrepreneurs and traders were provided a designated area of operation. The Namak Mandi, the Majith Mandi, the Atta Mandi are evidence of his plan. A prosperous commercial centre developed, a link between traders from across the Khyber Pass to the Sub Continent. The nucleus of this City, the Harmandir Sahib, is on the threshold of being designated as a World Heritage Site by UNESCO. It has already been acknowledged by popular BBC Holidays poll as the fifth most desired to be visited places in the world-much above the Taj Mahal and Great Wall of China. Apart from the beauty and grandeur of this temple, it is the spirit of secularism, the voluntary service and the sweet vibrations of divinity that draw over 100,000 tourists every day to this place of worship. Ten miles from the civil lines lies another spiritual center. The historic import of Ram Tirath has largely been ignored for too long. Its recognition as a pilgrimage and its management on the lines of Sri Vaishno Devi Shrine needs to be done sooner than later. It is the place where Sri Ram’s sons Luv and Kush were borne to Sita. It also the place where Ramayan was written by Rishi Balmiki. Closer home is the Durgiana temple which affords a striking resemblance to the Golden Temple and is a must see for all VIP’s coming to the City. Among the heritage sites of the city, Jallianwala Bagh stands tall as the edifice of sacrifice for the freedom of this great nation. 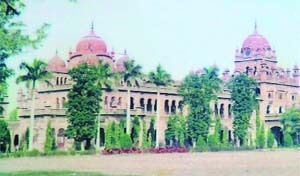 Another beautiful monument, today an educational institution of repute, is the Khalsa College. Not many people know that is college stands on the grounds where the first Muslim-Sikh battle was fought. A 40-minute drive through Tarntaran takes you to Harike Patan, perhaps one of the finest virgin bird sanctuaries in the country. At this meeting point of the Beas and Sutlej rivers one can see millions of migratory birds as well as 24 species of wild animals in their natural habitat. During one trip to this wetland, which is an internationally acclaimed Ramsar site, one even saw a group of seagulls flying into the horizon. The grace and beauty of the Siberian cranes and other fauna is in abundant evidence here. This is also the conservatory that supports the famous Fish Amritsari, a delicacy well known the world over. Kanjli, another wetland towards the historic Kapurthala town, showcases a glorious eco system of its own which is real pretty to the eye. Within the city, Ram Bagh gardens, the summer palace to the Maharaja now doubles up as perhaps the only lung of the city. An interesting museum in this garden tells tales of the bygone era of a great Emperor. No visit to the city is complete without a pilgrimage to the legendary Gurudwaras on the periphery of the city. Khadur Sahib where concept of Sati was stopped, and Govindwal Sahib where Concept of Langar was started are, among others, places to go to in search of peace and tranquility. Legend has it that one could get Moksha, through a specific prayer routine in one day, at The Govindwal Sahib. Within an hour’s drive from Amritsar, are Hargobindpur, Beas, Qadian, Pul Kanjri-heritage masterpieces worth a visit. Sri Hargobindpur is a clear picture of the secular vision of the Sikh Gurus. The sixth Guru constructed a masjid here for the Muslims known as Guru ki Maseet. Also in evidence are temples made by him in the vicinity. Jagdev Kalan, Famous poet Hashim Shah’s village is of much interest to all. In an era of Indo Pak brotherhood this could be a hotspot for mutual meeting grounds of interest. Preet Nagar-A village of and for poets, is now a Ghost Village and but still worth a visit. And of course last but not the least is the big draw-The energetic Retreat Ceremony at the Indo Pak border at Attari. That this is great fun to watch is obvious as big numbers gather each evening to watch the security forces of the two countries trying to outdo each other’s prowess in the show.